Wybunbury is a village near Nantwich in Cheshire, an Anglo-Saxon village, recorded as one of the earliest settlements in Cheshire. There is a lot of history attached to Wybunbury but that will have to be for another day. The tower stands back on a small hill, with views of the surrounding countryside, there are public footpaths that criss-cross The Moss. (The Moss is area around the village and that is another story) On a lovely sunny day it would a wonderful spot, but not in the cold, so it was a quick stop and a note to return when warmer. This was my first tower that was not really isolated, there is village to the left and going down the hill from the tower. The 15th Century tower is built in sandstone ashlar with a lead roof. The Medieval square tower has five stages. 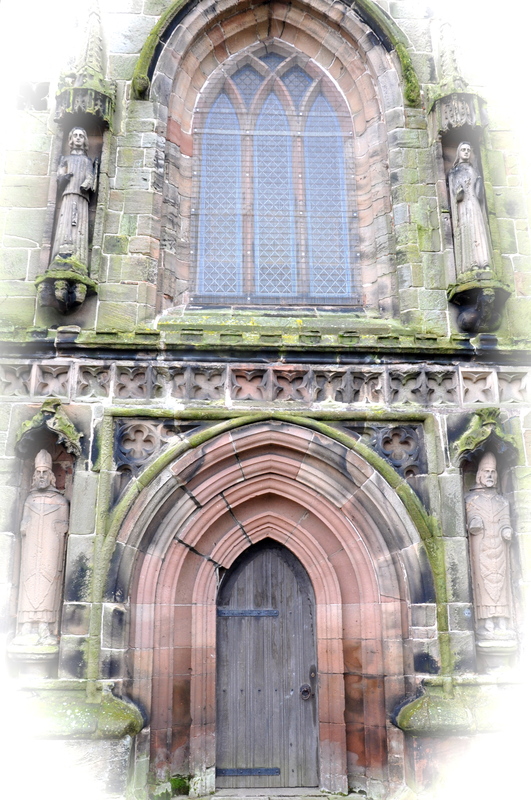 On each side of the door and windows are niches containing statues, could be Bishops. 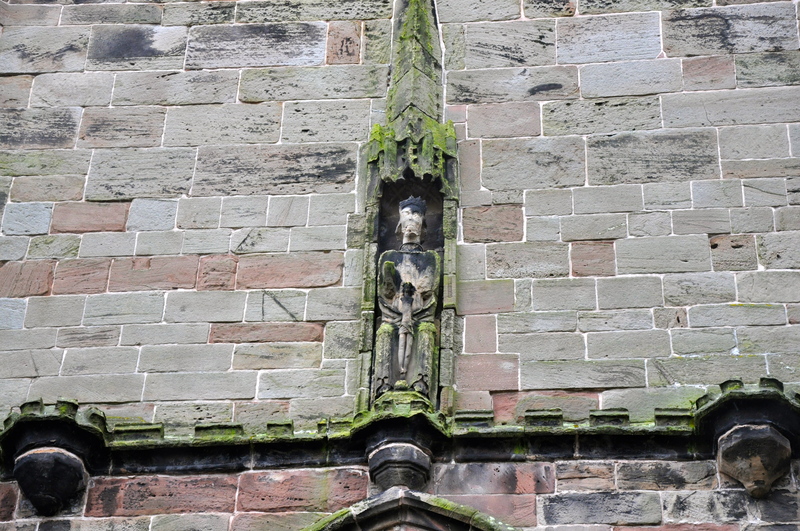 The original St Chad’s Church was adjacent to to the existing tower. There have been many churches on this site but due to unstable ground everyone of them has been demolished and all that remains of the 15th Century church is the tower. In total 5 churches were demolished 1595, 1793, 1833, 1892 and 1977. It was in 1975 that it was decided to build a new church on a more stable site and the new church was built in 1976. The tower was begun in 1470, around 1750 it was noticed that the foundations were settling and the tower was beginning to lean, the church at the time of 1833 was demolished and there was an attempt to straighten the tower and rebuild the church, but this church was demolished in 1976. 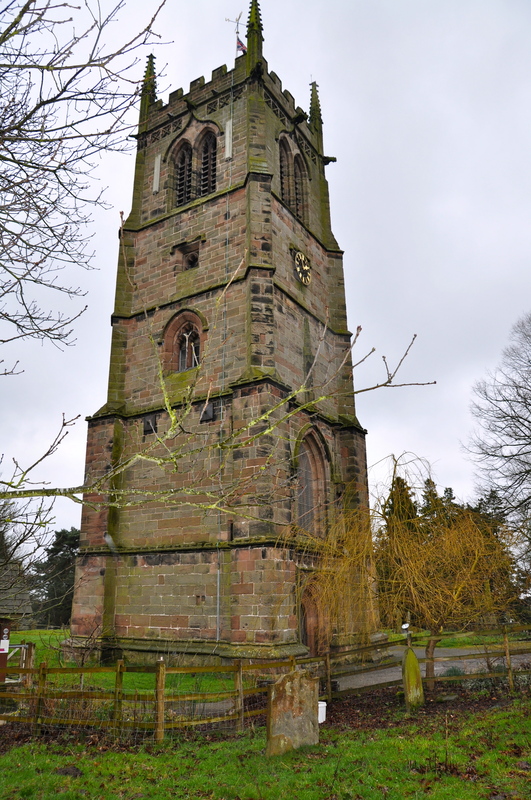 The tower is known as the ‘Leaning Tower of Cheshire’ and is one of the finest in the County. 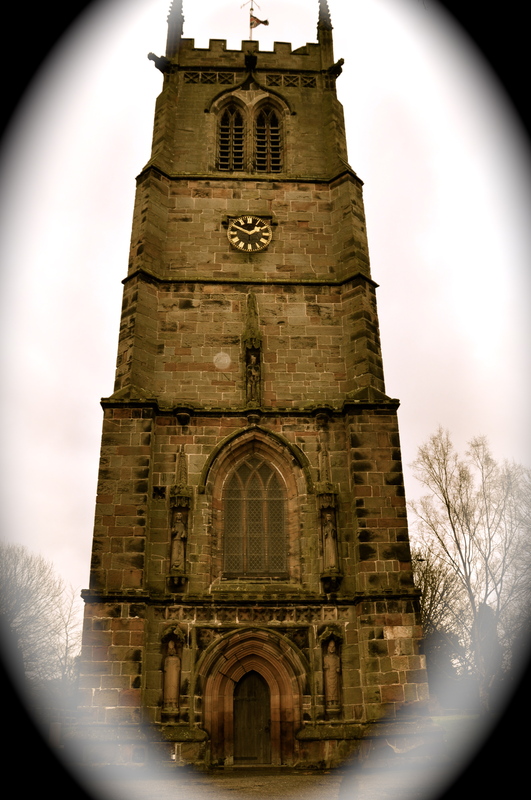 The tower was under threat in 1976 when they took down the last church but the villagers came to its aid and formed the Wybunbury Tower Preservation Trust in 1983. In 1989 the tower was straightened with hydraulic jacks and a base of reinforced concrete, I read somewhere that they left it leaning by 14 inches. The tower still has 6 bells dating from 1792 and the bells are still rung out (I use to be a bell ringer and it is not easy) The tower is a grade A listed building. The picture beneath is on the notice board by the lynch gate to show visitors what the church would have looked like….looks quite impressive up on the hill. Not sure which new church it is, but looking at the gentleman standing with the cane, I would say it’s the church that was demolished in 1833……but then it could be the 1892 one ….. 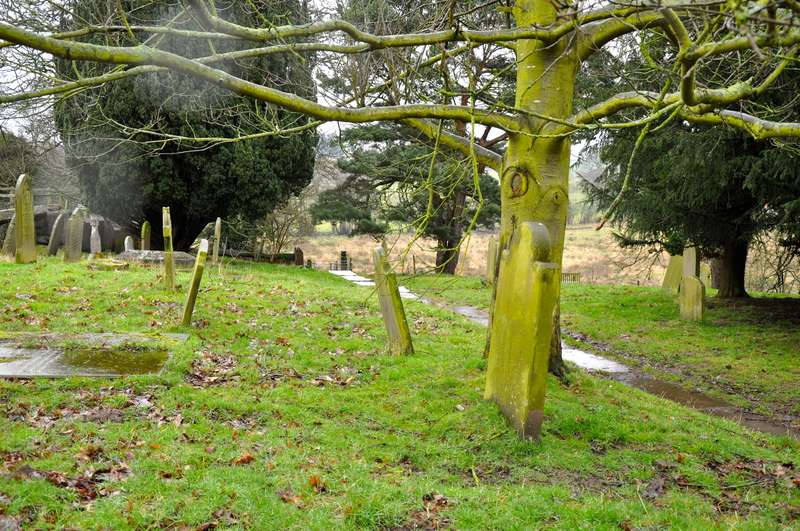 The Old Churchyard is an ancient graveyard and remains consecrated ground. There are some very old gravestones and those on their own are worth another visit, but when the weather is warmer. Even though it was a quick visit, I found I wanted to know a lot more, it was quite remarkable that they kept building these churches one after another, did they use the same stones. There are a few items remaining from the older churches in the New Church, must be worth a visit one day. If you look at the photo beneath and look in the distance you can see The Moss, its the lighter green colour. Very enjoyable post. Great photos indeed. Thank you, so glad that you like the post. I came to find my ancestors a few weeks ago. I found lots of them all clustered together. William Coomer and descendants. It is a lovely place, and beautifully tended with a lot of time care and effort. 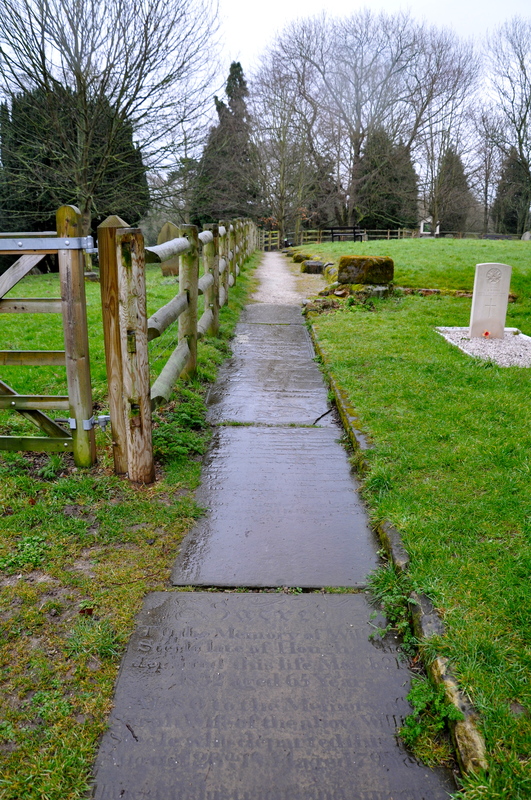 Very interesting – I love the gravestone path! Thank you for your visit and I too loved the path, but it was raining and it would have been better dry, so that you could read them. I love the old buildings and history, but they built FIVE churches before they realized they would need firmer ground? Well we are stubborn lot 🙂 They were not small churches either and each one must have built with the old materials from the pervious church…like recycling and we are very good at that 🙂 Not sure why they did, maybe they just thought it should be re-built on the same spot because there had always been a church there! Thanks for popping by. My ancestors were from Wybunbury and I am sure they must occupy some of those very old graves. The name is Bentley or Benetley. I am from Liverpool but live in USA now, so I can’t just pop over to Cheshire any more. Thanks for the lovely photographs and interesting info. Great piece, I was part of the group that tidied up the churchyard and put up the information boards. Watch out for the latest catalogue of the graveyard with all the tombs names etc coming in June this year. Hi Phylis, Yes there is one Bentley name in the Churchyard with the names Charles born July 31 1855 died march 18th 1924, Eva Their Daughter /born Dec 27 1903 /died Dec 7 1904 , Jane died jan 20 1946 aged 84 And Joseph. If its of interest I could get you a photo over. Well I just want to say that the notice boards were a great source of information and the churchyard look great and you all did a great job, it makes a difference when someone takes the time to care. Glad you like it and thanks for dropping by. 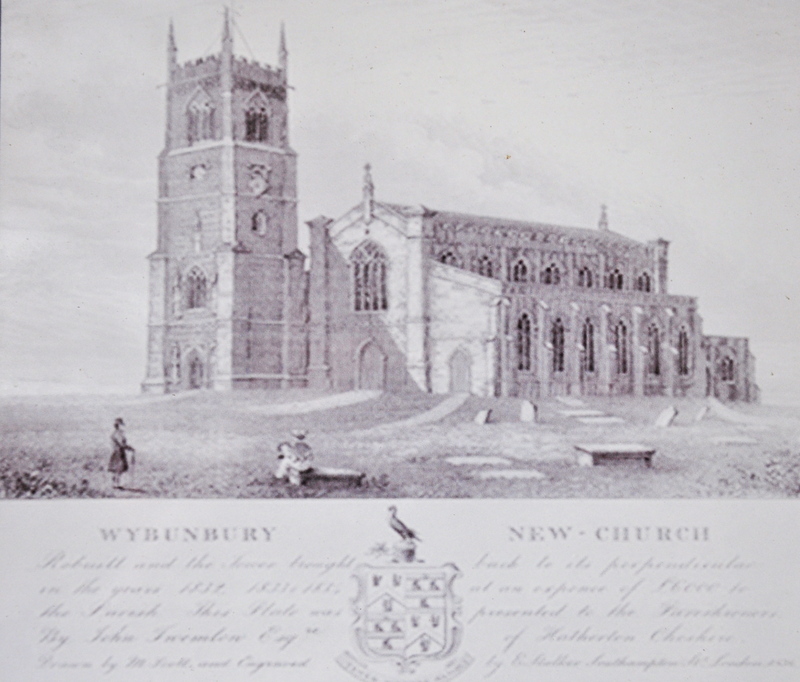 I have recently found out that a lot of my ancestors were in Wybunbury Parish and were buried in the graveyard. They were William Coomer and his descendants. When the weather picks up I will be coming to look for them. That’s brilliant, thanks. Ive been already and found lots of ancestors- all clustered together. But I will be coming again in better weather, so I will call in. Hi Ian. Are you still at the Swan Inn? My sister and I are coming to the village next Tuesday 27th June. We will call in to see you and maybe have lunch. I went to this church in the 1960’s with my now wife to make brass rubbings. Lovely to see your piece about it and to catch up with the story about its passing.